Hey. Im building a 10W green. I have the HR and OC mirrors. The amazing ktp and YVO4. I plan on getting a 40W 808nm bar. So I will be using the z-fold method. Can someone link me sources where I can learn more on the Z-fold and/or pictures of it being done. I checked out sam's fcts but cannot find enough on Z-fold. First off, you will not get 10W with 40W of pump, even in an ideal design. Could I get some specs on what you currently have? For example, doping of the YVO4, size and coatings, mirror coatings, diameters, ROC, etc... I can guide you through the cavity design, I have built and aligned several Z and L fold cavities at work. If you're using a large chunk of ND:YVO4 rather than a YAG rod, you'll probably end up needing an even more complicated "ring cavity". This allows you to pump the crap out of the vanadate on both sides. 10W is a serious, serious venture. You're looking at a lot of money in parts. Do you just have one HR and one OC mirror? Or do you have several HR's (with a couple that fold) and one OC? I would aim for maybe .5 or 1W in a linear cavity before going right for the z-fold or ring cavity. To give you an idea, even a healthy laserscope will only do around 15W CW of green and they are built very very well... so you can see how big of a deal 10W CW will be. I'm not saying you wont be able to do it, but just realize that you're going to have to invest a couple thousand dollars into this to get it going correctly. DIY DPSS is usually not much cheaper than just buying a commercially available system, and if you count the time you put into it, it's usually a lot cheaper to buy a commercial system, BUT it is very rewarding in the end. The vanadate you have is a good one, provided there is no knicks or burns on the faces of the crystal. I think it is water cooled though, right? I think some of them were (it would have water passages in it) and some weren't. I'm pretty sure it comes from a spectra physics millenia laser. Like I said in my previous post, this crystal is designed to be pumped from both sides, so you'll need to build a ring cavity for it. This involves a looot of optics ($$$$). For a ring cavity you'll need totally different optics, which one cant really find on the surplus market and you'll probably just have to buy them if you want this project to continue. I will post an example of a dual-pumped Nd:YVO4 ring cavity in a second. This is a very very very (and I do mean very... there will be other components in your cavity, this is the basics) simplified version of what you're going to need to build to get anywhere near 10W of green. You probably wont be able to find those optics used, nor will you be able to find a 'set' which is ready to go. You'll need to contact a company and tell them exactly what you need and they'll make it for you. The picture is a little confusing. I cant make out where things are going. So my optics are useless? Is my ktp good enough. And if this is true then I pretty much have the crystals but need to have a main focus on optics? Lets say I go z-fold or linear with the optics I have then how much power could I get out? I would strongly suggest trying a linear cavity first. In the picture the purple is your 1064nm intracavity beam, which will also have a bit of 532nm mixed in. The green line is your OC and the black lines are all HR mirrors. The purple block is the vanadate, pumped with 40W on each side for a total of 80W pump power. Use the optics you have to see if you can get the 1064nm lasing. If you can, thats a huge step. Then it's just a matter of swapping the right optics into your holders and re-aligning. Just keep in mind that there is a reason that everyone isn't walking around with a 10W green laser if they could be built for under $1000. I would say that even the cheapest DIY green with that kind of potential power will be at least $5000, and probably more. But I do have the crystals for it correct? Also have anyy links for holders and allignment stuff. I dont wanna just glue this i want it to be accurate. I would worry about finding the right optics first. Getting mounts and holders is pretty easy, optics are the hard part. Ya 10W was my theoretical. I was really hoping for about 4-5W. Think I can get this doing linear or such with a 40 or 60W 808nm? Also just for kicks could you list a few of the optics needed for the ring? I have a number of catalogs that I want to look into for optics and such. I'm going to say that your real limit with a linear cavity is going to be around 1W... anything above that will probably be at least a "V" cavity. I downloaded the program, but it is a bit confusing to me. I wanna go back to your picture you made quick. So what I fully see there is that you shoot a 40W at a 45 degree angle into one end and it comes out parallel on the other end. Repeat with the otherside. 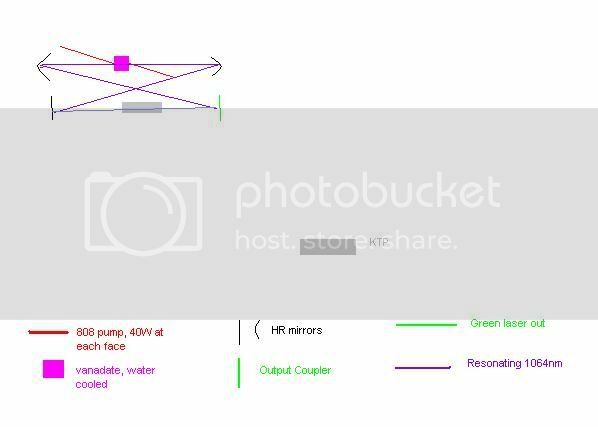 Then The light from the crystal is bounced to another area where the ktp is inbetween a full mirror and another which allows some of the light to go through. So pretty much there would be 4 main mirrors (3 HR and 1 OC). I know there will collumlating optics and TLC and the rest, but im just trying to get down the main optics. Yup you got it right for the most part. The only error is that the pump light doesn't have to be at 45 degrees and it won't exit in line with the crystal out the other side. The only thing that matters is getting the light focused into the crystal. The angle isn't super important as long as it can enter the crystal and excite it sufficiently. Basically your 808 is just making the crystal 'glow'. The light created by the glowing of the crystal is the light that will bounce off the mirrors and cause lasing to occur. Imagine it like something that glows in the dark. The sun is your pump and the glow in the dark object is your crystal. All you need to do is get sunlight onto that object to get it glowing and it will then create it's own light. In the laser, you just need to excite that crystal and then it creates it's very own light, completely independent of the pump source. So as long as the pump light gets in there and excites electrons, the direction of the light isn't very important. Ah I see. Ya it came to me of how the mirros work because gas has the the excited electrons excite more and they build up until they escape the one mirror so the right light can exite and the wrong does not. Any advice on the program? Its has a lot of complicated stuff to it. Here is a perfect example of what you will need to build. This is a ring cavity with a bi-axially pumped Nd:YVO4 (like yours is designed to be) This setup uses an LBO rather than a KTP, but the setup will be the same.